This is really not a news but i guess this one could be the next hype this summer in Ibiza. 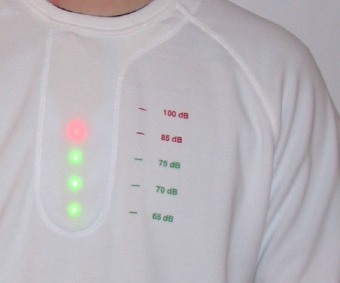 For now this prototype Noise Shirt has a microphone that measures the surrounding environments noise level and displays it as a vertical 5 step equalizer bar with the LEDs. Each LED marks a rise above a certain decibel level. The three lower LEDs go from 65dB to 84dB. The top two LEDs mark a noise level exceeding 85dB and 100dB. Continuous exposure exceeding 85dB is the limit set by the European Union for recommended use of hearing protection.